During the time when the judges ruled, there was a famine in the land. A man named Elimelech took his wife Naomi and his two sons to the country of Moab because there was food in that land. Elimelech died, and Naomi was left as a widow with two sons. The sons married. One married a woman named Orpah, and the other married Ruth. After about ten years, the two sons died also. Naomi decided to go back to her home country, to the town of Bethlehem. Both of her daughters-in-law wanted to go with her, but she told them that they should stay in the land of Moab. Ruth insisted on going with her mother-in-law. The two of them went to Bethlehem. Naomi's friends were so glad to see her again! In those days, according to God's command, when a farmer harvested his field, he had to leave the grain that fell for the poor people to pick up. This gathering of the left-over grain was called "gleaning". Ruth went to "glean" in the field of a man named Boaz. He was a relative of Naomi's family. 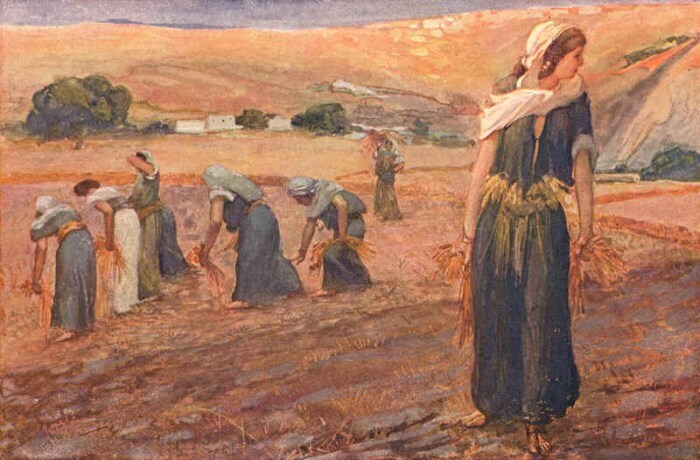 Ruth worked hard gathering grain to feed herself and Naomi. Boaz noticed how hard she was working and told her to stay in his field to glean. He invited her to eat with him and he said he would protect her from harm. Boaz wanted to marry Ruth, but there was another relative who had first choice of taking care of Ruth. The two men had a meeting. The other man decided that he couldn't take care of Ruth, so he took off his sandal, as the custom was, to seal an agreement. He told Boaz to buy the land and marry Ruth. They were married and later had a son named Obed. Obed, when he was grown, had a son named Jesse. Jesse's son was David. The great-grandson of Ruth became king of Israel, King David! One of the greatest lessons we can learn from Ruth is the lesson of kindness. She was extremely kind to her mother-in-law. Do you look for ways to show kindness to your family and friends? Do you put others first, or do you insist on having your own way? 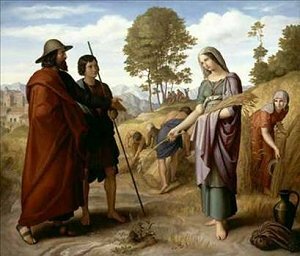 Ruth was richly rewarded for her unselfishness. She would marry a fine man, Boaz, and she would become an ancestor of our Lord Jesus. Show unselfishness and God will be pleased. 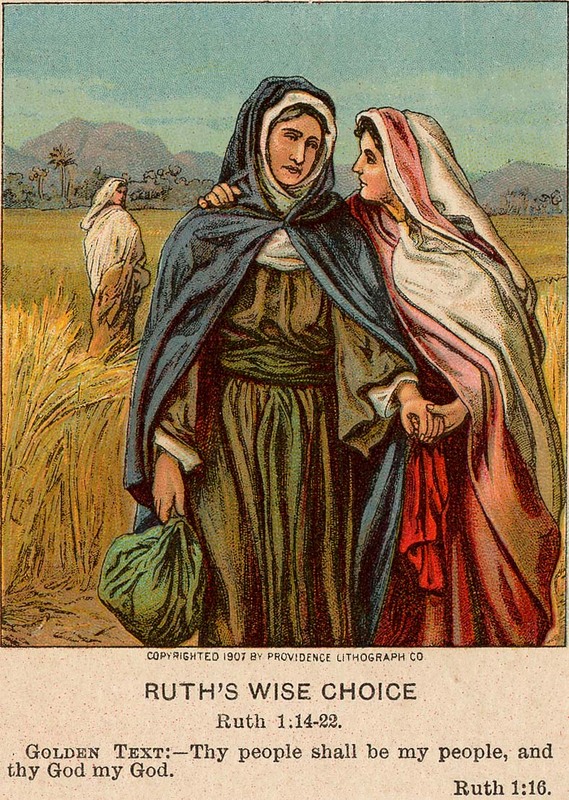 The story of Ruth and Naomi can be found in the Bible in the book of Ruth chapters 1-4. English Bible Activities Select stories #67-69 in the list for activities to accompany this Bible story. Spanish Bible Activities Select stories #67-69 in the list for activities to accompany this Bible story. Press "Go" to search for books about Ruth. oh my gosh!! i am a childrens minister and i am always looking for ways to keep everything fresh for them..I FOUND IT! I never knew someone could be so kind to do thios as i run my ministry with no money except my ss and this is truely GODS WORK..God Bless You!! This page displayed 248,214 times.